You'll be £24.00 closer to your next £10.00 credit when you purchase German Battleship Helgoland. What's this? Alongside its incomparable archive of British warship plans, the National Maritime Museum at Greenwich also holds a selection of drawings from foreign sources. Among the gems of this collection are a number of German warships dating from the First World War era. These are official plans, acquired by the Naval Inter-Allied Commission of Control as part of the peace treaty, and very similar in style, detail and draughtsmanship to Royal Navy ‘as fitted’ general arrangements, including the use of coloured line and washes. The very best of these, in terms of the completeness of coverage and the visual impact of the drawings, relates to the battleship SMS Helgoland, launched in 1909. The name-ship of the second class of dreadnoughts designed by the Germans, she was a big advance over the earlier Westfalen class, having 12in guns that matched those of her British opponents. She served in the High Seas Fleet throughout the war, fought at Jutland, and was ceded to Britain as part of the peace terms – which is probably why the plans are at Greenwich – and was broken up in 1924. This book is the latest in a series based entirely on original draughts which depict famous warships in an unprecedented degree of detail. Using the latest scanning technology to make digital copies of the highest quality, it reproduces complete sets in full colour, with many close-ups and enlargements that make every aspect clear and comprehensible. Extensive captions point the reader to important features to be found in the plans, and an introduction covers the background to the design. The result is a novel form of anatomy that will be a revelation to any warship enthusiast. A beautiful and accurate book. 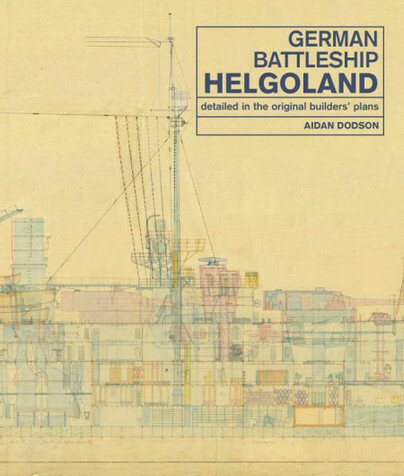 This book should be considered an absolute must-buy for anybody wishing to build a detailed model of SMS Helgoland or her sister ships. I would also recommend this book to anybody who has more than a passing interest in either WWI Maritime subjects or technical drawings in general.